Coaching is expanding - to groups, teams, peer coaching and coaching as leaders. Practical ideas to add to any coaches toolkit. Practical tips, tools, and insight on successful team and group coaching engagementsAs professional development budgets at many organizations remain flat or even shrink due to financial pressures, coaches and human resources leaders are looking for new ways to do more with less funding. Team coaching—which may span intact teams, project teams and virtual teams—and group coaching—spanning both organizational and public contexts—offer a solution to this developmental puzzle. 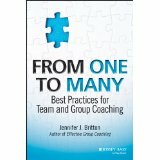 Unfortunately, there are few practical resources available that address the best practices for team and group coaching. From One to Many fills that gap for coaches, leaders, and human resources professionals. The book explains how to integrate the practice into an organization and how to maximize it to full effect. You can now pre-order a copy direct from us and also receive five hours of bonus digital content.